We love retail and retailers love PrognoStore! This is a fact, here’s why. PrognoStore is a 3 in 1 cloud based solution that consists of Point of Sale, Inventory and Analytics; all that you need to run your store successfully. We love retail and retailers love PrognoStore! This is a fact, here’s why. PrognoStore is a 3 in 1 cloud based solution that consists of Point of Sale, Inventory and Analytics; all that you need to run your store successfully. It has been specially designed and equipped for small retail store owners to ensure that their businesses run effectively and efficiently. Sell: It’s so easy to sell with PrognoStore on every channel. Our Point of Sale is fast, simple to use and works on ipad, mac, desktop or laptop. Your customers would love the beautifully printed or even digital receipts offering your customers a beautiful mobile check out. 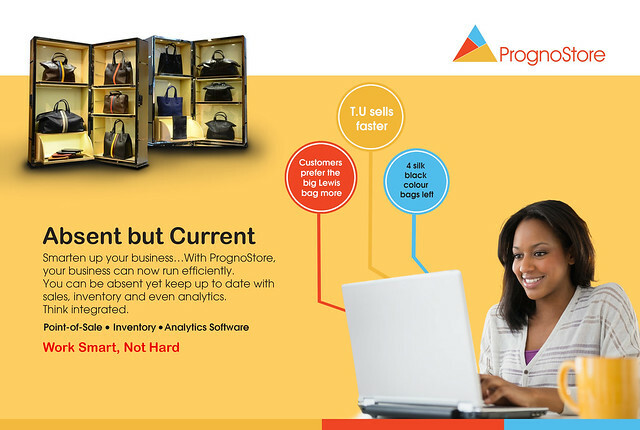 Inventory: Prognostore helps you to manage inventory and orders painlessly. However you click, collect and finalize them because PrognoStore puts you in control of your inventory. It's easy to add products; either one at a time or all at once (by hundreds or thousands) We'll help you know that you have just the right amount stock that your customers want to buy from you. Amazing right? Customers: On every sale PrognoStore tries to create memorable experiences for every customer. Sign customers up and PrognoStore keeps record of every customers data, which reminds you of notable or important events of that customer. We keep you coming back with new updates and features to make your small business easy to grow. With Prognostore, you'll always be close to customer's hearts and minds. Reports: Prognostore is great for analytics. It actually shows what product makes money and what product doesn't. Whether you are just opening your 1st store or 21st store, real time insights enables you make smart data-driven decisions to grow your business. Grow: Prognostore would help you grow, save costs, monitor your stores; check in on stores like you are always there even if you are not and even add new sales channels and locations at the click of a button. It even helps you manage your business in the cloud.